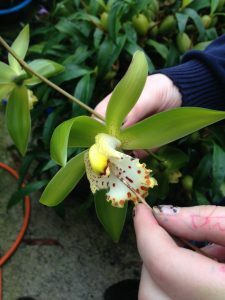 Thanks to everyone who voted – it was a close thing but January’s winning orchid is the wonderful species from Sikkim, Cymbidium hookerianum. 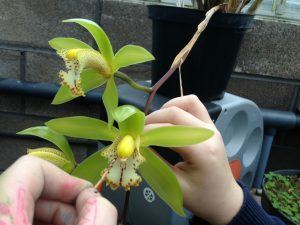 As the photos above show we have now cross pollinated our two clones of Cymbidium hookerianum by taking pollen from the slightly larger flowered plant on the left and placing it onto the smaller flower on the right. Students took it in turn to pollinate three flowers and so we can expect about six million seeds in twelve months time and plants for sale in flask from about 2019 onwards. The pollen looks very fresh and healthy and, as you can see below, Cymbidiums produce two large pollinia on a short stipe ending in a sticky pad called the viscidium. Hand pollination is straight forward. 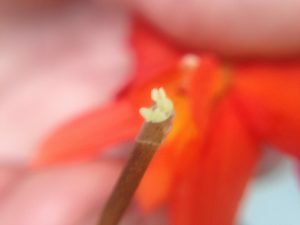 The stick acts like the pollinating bee and when it is pressed against the viscidium it attaches firmly to the end of the stick and we can move the pollina across to the stigmatic surface of the flower which will develop the seed pod. We will keep you updated on the seed pod as it develops. 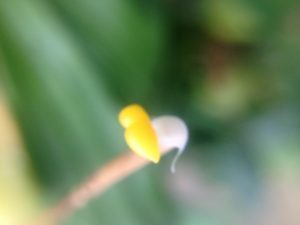 Not all orchids have two pollinia. We also pollinated Cattleya coccinea (which came second in Orchid of the Month) and this species has eight pollinia (photo below). This time the stick acted as the beak of a humming bird.